Verge mining exploits have been resolved & new Verge miner [beta] for windows! A few days ago Verge (XVG) suffered from a timestamp attack wich allowed the exploiters performing the attack to mine Verge effortlessly with a super low difficulty. (more info, scroll all the way down) The issues have been resolved already though on may 25th, and everything is running smooth again. 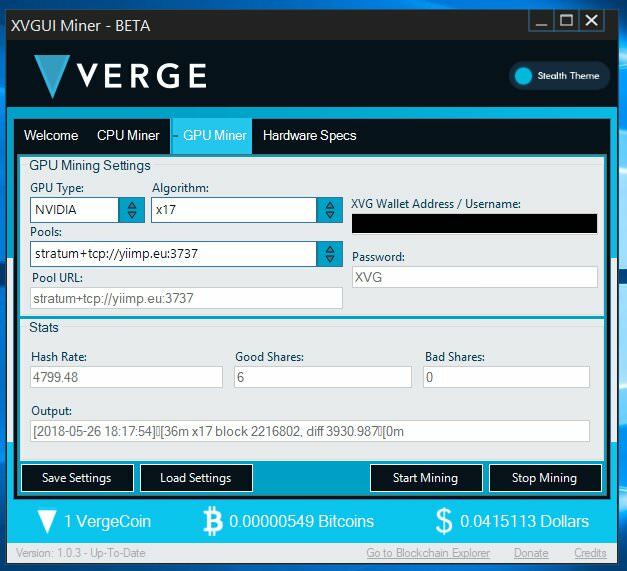 Recently community member Gridcore released his Verge GUI miner, a super easy to use program that allows you to mine Verge (XVG) on your Windows desktop. The project is opensource and is currently in beta and only available for windows currently. Thanks for reading this small post, more news will come out soon most likely. Can you mine to a Binance address or do you need a Verge wallet address? @gridcore might be able to help you out. Can any Anyone knows what is the best verge algo to mine and how , using 4 AMD GPU. I am using blake2s and noticed a big diff between calc reward and real one.